Brethren and visitors to Wyre Lodge No 7704 were extremely pleased to receive as the representative of the Provincial Grand Master Tony Harrison, Geoff Pritchard. Geoff was accompanied by North Fylde Group Chairman Peter Greathead and fellow grand officer Duncan Smith at the installation of Danny Whalley into the chair of ‘wonderful’ Wyre. Geoff Pritchard (left) and Danny Whalley. WM Tony Moran dealt with the early part of the business in his own inimitable style. 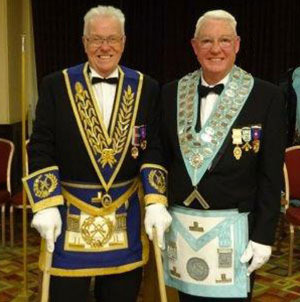 Tony then passed the reins of the lodge to Tony Blundell to install Danny. On opening the lodge in the second-degree Tony invited Frank Kennedy to act as installing senior warden, Andy Walch to act as installing junior warden and Ken Mackie to act as installing inner guard. 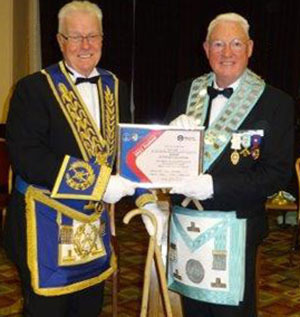 The master elect was presented for installation by Bob Hopwood, Wyre’s very hard working director of ceremonies. Tony then proceeded to install Danny into the chair of King Solomon in a most dignified manner. The presentation of third degree working tools was delivered with elegance by Mathew Hopwood. Ken Mackie’s delivery of the long version of the second degree tools was without flaw and Bert Openshaw expertly presenting the first degree tools. Danny then proceeded to invest his officers for the coming year which was followed by the address to the wardens which was superbly delivered by Duncan Smith and the all-important address to the brethren of the lodge was given by Geoff Pritchard. Geoff Pritchard presents Danny Whalley (right) with a Festival Patron’s certificate. The installation completed, Geoff rose to bring the congratulations of the Provincial Grand Master Tony Harrison to the new master and the brethren of the lodge. The new master presented Geoff with a list of donations that the lodge had given over the past year; £1,000 to Feet First Charity to rebuild and refurbish a hospital ward in Malawi, £200 St Andrew’s Church to assist in replacing leaded windows, £200 Fleetwood Masonic Hall Ladies’ Committee, £300 West Lancashire Scouts, a 2019 project to assist in building water wells in Uganda, £200 to Trinity Hospice, Blackpool and £1,370 to Rosemere Cancer Foundation, proceeds from a sponsored walk undertaken by lodge secretary Martin Clements along Hadrian’s Wall, coast to coast, £1,000 for the Mustard Seed Group helping homeless people in Fleetwood and £1,000 to the Masonic Charitable Foundation making Wyre Lodge a Patron of the MCF – a total and outstanding amount of £5,270. Geoff thanked the lodge brethren for all their hard work for charitable causes and presented Danny with a Patron’s certificate on behalf of the MCF 2021 Festival. The installation meeting was held at the Imperial Hotel, Blackpool. Wyre Lodge not being one to conform to the usual format of an installation decided to combine the installation and their ladies evening. Straight after the ceremony 150 guests gathered to celebrate Danny Whalley’s installation. While their men folk were at the installation the ladies were suitably entertained by clairvoyant medium Helen Chadwick. Lynda Whalley receives a rose from John Gillan. 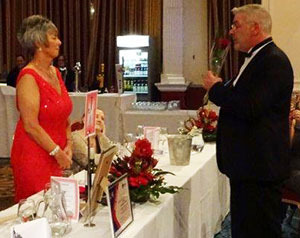 Wyre Lodge’s ladies evening was designed around a Christmas theme. There was a Christmas tree at the entrance of the ballroom where guests placed Christmas presents that were destined for presentation to the Salvation Army. These gifts will be given to underprivileged children over the festive period. The ballroom was beautifully decked out with Christmas balloons. The table centre pieces were suitably themed in reds, golds and greens. The sumptuous feast continued the Christmas theme with turkey for the main course. Entertainment throughout the meal was provided by the sounds of Thornton and Cleveleys Brass Band. Guests enjoying the banquet and Thornton as Cleveleys Brass Band entertains. After the meal the evening continued with the ‘rose’s song’ with the last rose suitably presented to the master’s wife Lynda, which was delivered by John Gillan who entertained with a mixture of comedy and songs sung in both English and Italian. The evening rounded off in fine fashion with casino tables to raise money for charity and a DJ to entertain. Bob Hopwood was the bravest of DC’s, doing a ‘West Houghton’ raffle in a room filled with 150 guests which raised over £360 for Masonic and non-Masonic charities. Pictured left to right, are: Bill Sargeant, Dave Platt, Frank Kennedy, Bob Hopwood, Duncan Smith, Peter Greathead, Geoff Pritchard, Danny Whalley, Tony Blundell, Tony Moran, Clem Smith, Bert Openshaw and Ken Mackie.